…zee (the sea or ocean)! Me love the ocean. It is the home of many beautiful plants and animals. 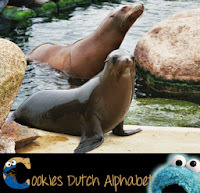 Like the zeehond (seal) and zeeleeuw (sealion) to name just a few beautiful animals. And – that is no coincidence – their names start with the letter Z! Yes me finally got to the last letter of the alphabet. 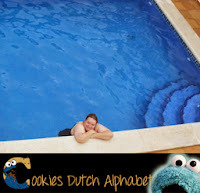 Also nice and starting with the letter Z is zwembad (swimmingpool). 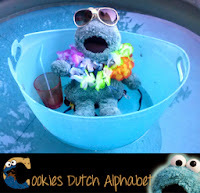 Berry loves to swim (zwemmen) at the pool. She goes every week to the pool for a class of aquarobics. Me will hang out at the lockers though, me do not like to swim that much. Although, me love to chill at the pool! Next up: yummy food starting with the letter Z! Starting with zuurkool (sauerkraut), mostly mashed with potatoes and pieces of bacon, and a rookworst. You got to love it though. Me? 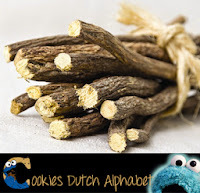 Me love other stuff with the letter Z, like zoethout (liquorice root). It really is a piece of wood that you can chew on. It is also used as an ingredient for tea and drop. Me love candies! 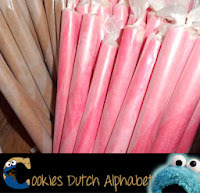 Really Dutch is the zuurstok (candy cane), but not the white/red ones you hang in the Christmas tree, but the cherry or cinnamon flavoured Old Dutch candy canes. There are – ofcourse – other flavours too. But the cherry and cinnamon ones are really me faves! 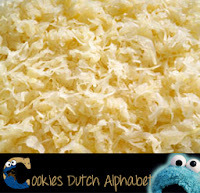 Oh and me love zuurtjes (sweets or lozenges) too. They are so colourful and often very fruity. 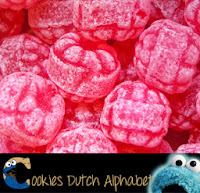 Really old Dutch are the raspberry zuurtjes and pear zuurtjes. 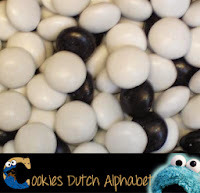 Also yummy is zwart-wit (black and white liqourice). It combines salty liquorice powder with some peppermint. You can eat it out of a tiny jar, or as some hard liquorice candy. Zwart (black) is also a very exciting colour. Me googly eyes are black. Gorgeous huh. And to end the letter Z, me will tell you a little bit about my favourite fairy tale character: Zwarte Piet (Black Peter). He is the loyal helper of Sinterklaas (like Santa’s Elves) and together they bring gifts to all the children and sweet Monsters a like! 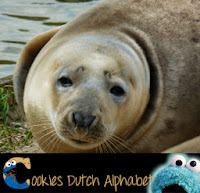 And that concludes the letter Z and Cookies Dutch Alphabet. Me had so much fun the past 26 weeks. Me hope you had too. Feel free to drop me a note (a positive one please) about your favourite letter. Now me have to think of something new to talk about… Ah well, me is a creative blue Monster, me will think of something. 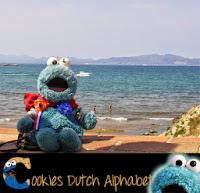 Next week me will recap the whole alphabet so you can enjoy it with me one more time!